A Pinch of Salt, A Dash of Sass.Grilled Crispy Pork Belly - A Pinch of Salt, A Dash of Sass. This version of grilled crispy pork belly is special because it doesn’t involve extra steps like puncturing or scoring the skin. 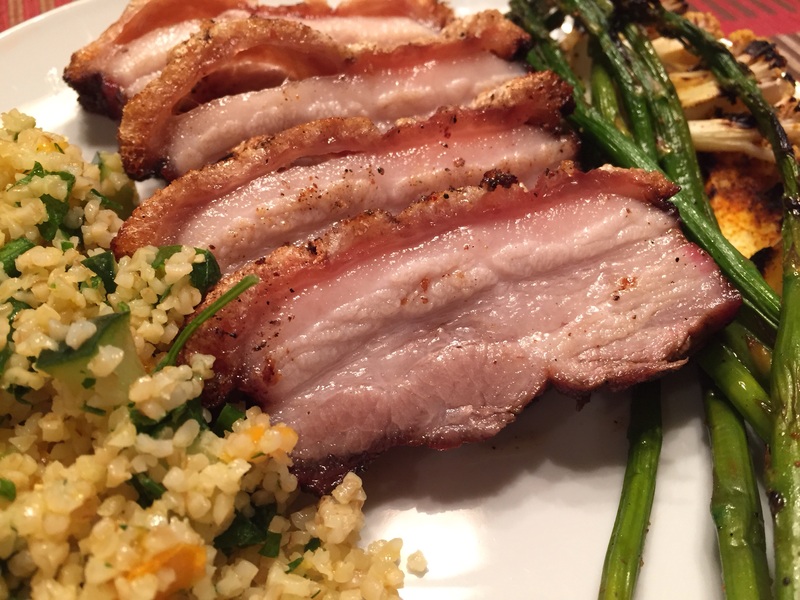 I have often made crispy pork belly, and have always followed the extra steps. When I found this method by checking out recipes from kirbiecravings.com and rasamalaysia.com, I thought it was too good to be true — a kosher salt crust that makes brilliant, golden, crispy skin? SOLD, I say! SOLD! And the kicker? It works! And, it’s delicious! This recipe is so easy, and works so well, I hope you will explore the amazing world of golden, juicy, crispy, delicious pork belly! I get mine from an excellent local farm, Double R Farms in Oklahoma which raises awesome pastured, heritage pork. Better pork means better results, but if you don’t have a local farm you should try a local Asian supermarket to get your hands on big hunks of pork belly! An adaptation of an oven-roasted recipe, to make grilled crispy pork belly with crunchy cracklings and juicy, flavorful meat. In a large shallow dish that will hold the pork belly lying flat, combine all the marinade ingredients. If you have a needle-style meat tenderizer, turn the belly over and on the meat side, get a bunch of holes going -- this isn't mandatory, but it will help the marinade penetrate the meat. Place the pork belly meat-side-down into the marinade, but keep the skin dry. If the skin gets wet, it won't make that delicious crackling. Let the belly marinade for 3 hours, or overnight, in the refrigerator. Preheat your grill with indirect heat (coals on one side of the grill, or only light gas burners on one side of the grill). While it heats, take the belly out of the marinade and pat dry. Spread the one cup of kosher salt evenly over the skin, patting it gently into place. On a rack, over a pan, place the pork belly on the side of the grill away from the direct heat. Pour some water into the pan to help catch the pork drippings. We're looking for a temperature range of 325-350 degrees here, so monitor your fire and keep adjusting it accordingly. We are making an oven out of a grill, here, so keep it covered. After one hour, start periodically checking to see if the salt has hardened into a shell. That is your signal that the pork is roasted and you're ready to crisp the skin. Remove the belly from the grill. Remove the salt crust and brush off any extra salt that sticks. Crank the grill up to 450-475. While the grill gets hot, brush the pork skin with the 1 tsp of oil (or ghee, YUM!) and sprinkle with black pepper and any other spices you might like. I used granulated garlic. Return the pork belly to the grill skin-side up, once again on indirect heat. I started it on the rack and pan but ended up moving it to the actual grill grate. Your mileage may vary! Leave the belly in this screaming hot covered grill until the skin blisters all over and becomes crispy. Remove the pork belly from the grill and let it rest for about 10 minutes. To slice, use a very sharp knife and turn the pork belly skin-side-down on a stable board. Cut into half-inch slices. Serve warm. DIG IN! Also, make yum-yum noises and fight over seconds! This recipe is inspired by pork belly recipes from kirbiecravings.com and rasamalaysia.com!